"Reflections" on EN83 (Mid-Michigan) HSCW portable operation 1999 Dec 23-29. With a good location and an adequate (tho small) rig, it was surprisingly easy to give out a new grid to several fellows, operating about 4 hours per day. But sporadic MS work is usually not quick. It uses "sporadics," and is a weak-signal long-distance mode. But with high speeds, it can be extremely effective! This is the second time I've operated portable with this setup (IC-7Ø6, no preamp, TE amp at 15Ø-18Ø watts, MFJ switching power supply, 11-el KLM Yagi on 2Ø' (3 M) telescoping pole, WinMSDSP running on GW2K 51ØØ Solo laptop). The location was good - land very flat in all directions, tho many trees at some headings. This is all quite different from the home QTH, with an 8877, 4 KLM 16-element Yagis, but in a valley and surrounded by tall trees. We ran skeds with 11 different stations, completing with 7 of them (twice with NØKQY - once on sked, once on random). List at end. However, to me, the details and observations this time are more interesting than the actual completions. I'd like to present a few observations from this portable operation, combining them with what I've noted from other, similar operating in this country. And perhaps it will help those not yet on or new to MS to know better what to expect. Observations on HSCW MS work by the smaller or portable station. 1. The 3 most important factors are location, location, location! a. You need a good height over average terrain. Even tho last summer's Minnesotta operation seemed to be on higher ground, there actually were hills around us. b. 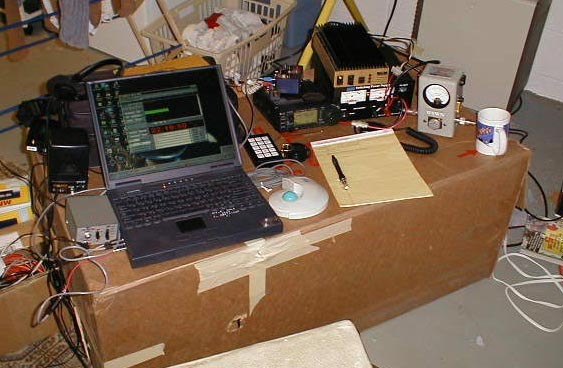 If stations are small, concentrate on the "best" distances. and 1235 miles was not worked [at 111Ø miles, and his antenna was also up only 2Ø feet/3 M]). 2. Next most important is ERP. a. Most of the stations had more power, and I heard them better. b. However, I occasionally had very strong pings, even at the greater distances. c. 3 dB more gain would have helped a lot! d. Most skeds produced a good number of pings both directions. 3. Nearly all skeds required a full hour. a. My lower ERP just wasn't enough for the usual 3Ø-min HSCW sked. b. Two skeds were required for two of the completions. c. But under 6ØØ miles/966 km, with smaller stations - nothing completed, tho reports exchanged. (I should have completed with one, but he developed problems). 4. MS conditions were good but not exceptional. a. June thru January is the best time of year for "sporadic" work. It might not be worth the effort in the period of February through mid June with a small station. b. However, there were no major showers in progress. 5. The question was asked, "Could SSB have worked?" a. All but about 2 said "absolutely not." b. A couple said "possibly," if the pings had come just right. (And conditions were good one morning). 6. Most pings were very weak and very short. a. A simple audio filter would often pull out another letter or two. b. Most pings were just above noise level, less than 1/1Øth sec. Yet a surprising number were quite strong. 7. Having an accurate watch, and knowing that I was on freq, plus often announcing my freq and sequence, kept down problems. 8. 6ØØØ LPM was used for most skeds. 8ØØØ should have been better, due to the very, very short pings. 9. The number of stations worked is smaller than for Europe. However, we completed with all but 1 available station "in range"! If more had been available, no doubt the number of QSO's would have been higher. 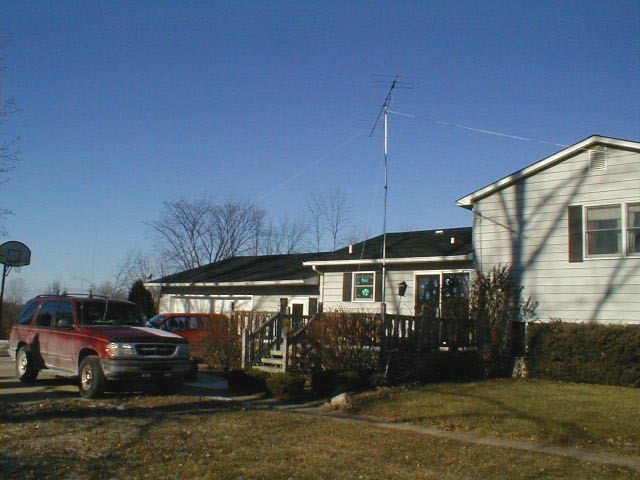 10 The inability to elevate the antenna greatly hurt the shorter (under 6ØØ-mile) skeds. (For more on elevation vs. distance, see the elevation chart). 11 All regular operation was by schedules (made over the Internet) due to the low density of operators in North America. (No real-time data was exchanged over the Web during schedules). a. In North America, schedules are necessary! b. CQs were called at the end of the schedule period, producing one contact (with NØKQY). K4SSO - 5Ø4 miles, 811 km - Many short weak pings, no contact (5 skeds). W1FIG - ~65Ø miles, 1Ø46 km - QSO..
KØXP - 65Ø miles, 1Ø46 km - QSO..
VE5UF - 1235 miles, 1988 km - QSO (2 skeds required)..
WØPHD - 744 miles, 1198 km - QSO..
NØKQY - 988 miles, 159Ø km - 2 QSOS (1 sked; 1 random, quick)..
K9KNW - 1188 miles, 1912 km - QSO. NØUK - 48Ø miles, 772 km - good sig, not complete..
N4OFA - 458 miles, 737 km - 2 skeds, no good, almost no pings..
N5SWX - 641 miles, 1Ø32 km - QSO..
KØGU - 111Ø miles, 1787 km - not complete (his ant also up only 2Ø', however). You will immediately notice the lack of contacts shorter than about 64Ø miles/1Ø3Ø km (exactly as is to be expected, especially for randoms). The "steering rope" on the back of the antenna was tightened in an attempt to elevate the angle some, and offsets in azimuth were used. However, (again as the books suggest) the pings were very, very weak and short, and not very many. (Again, for more on elevation vs. distance, see the elevation chart). There were no requests for skeds beyond 1235 miles/1988 km. From past experience, however, unless the station at the other end had a very good location and tall tower, it would have been difficult for me to work beyond about 128Ø miles (tho probably not impossible). Since I don't do roving or mountaintopping work, there are no plans to attempt to raise the portable antenna any higher. Thanks again for those who ran skeds, and for those who had worked me but continued to monitor other skeds and send in reports. Also, the full story & photos of last summer's Minnesotta operation are available for comparison, as it was quite different in some ways.